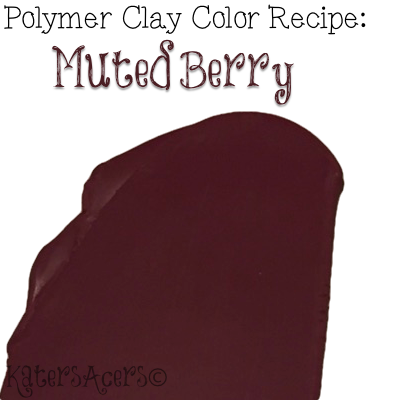 Premo color recipe in Muted Berry for polymer clay. A few weeks ago I introduced you to the Fall 2017 color recipes. I hope that you’ve taken some time to look through them and enjoy them as well. I wear a ton of burgundy, plum, and berry colors in general. In fact, my closet is jammed packed with them. It’s funny how the colors we prefer to wear, we don’t use as much in our studio. Here’s today’s gorgeous muted berry color recipe. Use this with any of the Fall 2017 Color Palette Colors. Add 1 more part Ultramarine Blue for a more purplish tone. Add 1 more part Orange to add more brightness and reduce the muted effect of the blue. Pairs well with light blue, pink, and cream-toned acrylics or inks to help it stand out in the crowd (get my recommendations here). Free polymer clay tutorials are made possible by the Whimsical Sculpting Tutorial Club.